Depending on your Data Protection policy provisions and permissions/consent received from the giver, you can easily add unlinked Givers to your Address Book without the need to re-type all the contact information already held in their Giver profile. Once added, the contact's giving profile is then linked. From the unlinked Givers profile page of the Giving module, select Add contact from the action cog (as shown above). This option will only be available where a Giver has not already been linked to an Address Book contact. If the Add contact action is not visible, the giver is already linked to a contact in the Address Book. Selecting the Add contact action will populate all available giver contact information into a new Address Book Add contact page. 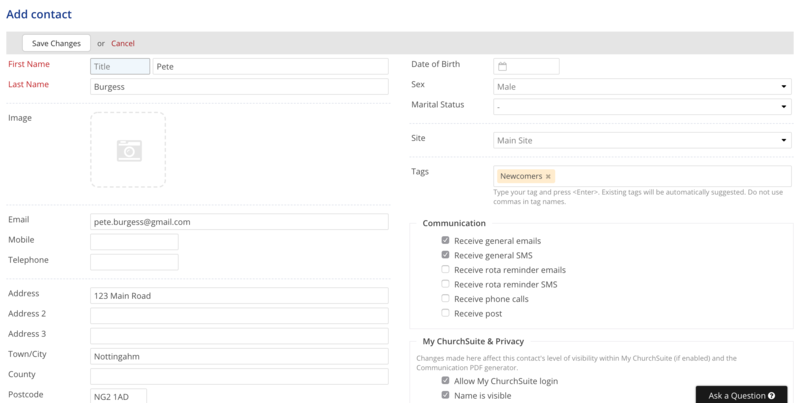 You can add any other known information before saving the new contact to the Address Book. The giver profile is now linked to that Address Book contact. For EU churches subject to the data protection legislation of the General Data Protection Regulation 2018, you may wish to review the communication preferences of the new contact before saving the new contact. 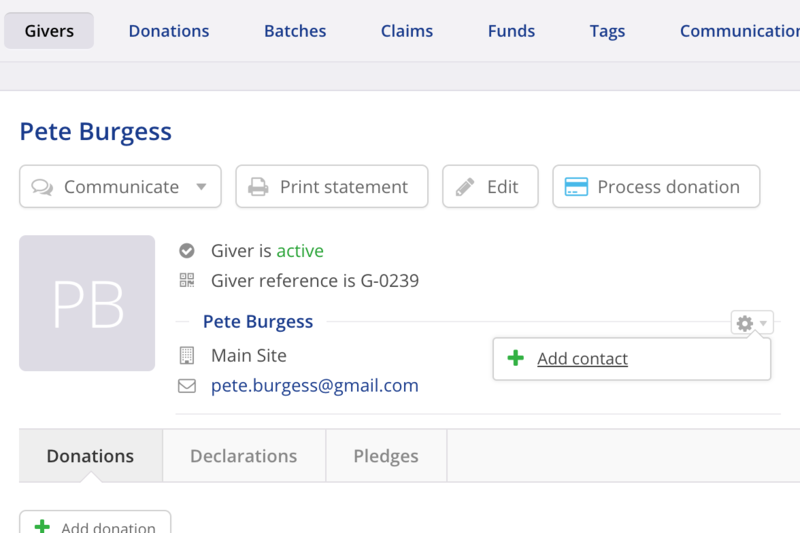 For example, within the Giving module your unlinked giver may have been set to receive emails and SMSs because you had a legitimate interest or legal obligation lawful basis for processing. As a contact now in your Address Book your communications to that contact may be subject to a different lawful basis for processing under the GDPR e.g. consent. Consequently you may wish to opt out the new contact until you have obtain the appropriate consent from the data subject.